In the Mauritanian village of Bassiknou, al-Qaida members approach a crowd at a local trading market. Carrying video cameras, they preach fiery sermons encouraging locals to engage in holy war and ask those at the market if they will read aloud poems for the late Osama bin Laden. The scene from early last month represents one of al-Qaida in the Islamic Maghreb (AQIM)'s most important contributions as part of the al-Qaida network: propaganda. When picked up and distributed by news outlets, AQIM videos, public statements and stories of its terrorist attacks and kidnappings lend legitimacy to the global al-Qaida network and moral support to al-Qaida fighters operating in other branches. "AQIM allows al-Qaida to say they have one more front," Andrew Lebovich, a policy analyst with the New America Foundation who closely follows AQIM, told the Investigative Project on Terrorism. Al-Qaida chief Ayman al-Zawahiri did just that in a statement released after Navy SEALs killed Osama bin Laden in his Abbottabad compound May 2. Al-Zawahiri assured his "mujahideen brothers" in the "Maghreb of steadfastness," and other branches, that they are all "walking" with "combined ranks, and united word, and harmonized hearts and pure banner, fighting one enemy." In northwest Africa, AQIM has entrenched itself in the sub-Saharan Sahel region of southern Algeria and in Mali and Mauritania, in addition to the mountainous Kabylie region which borders the Mediterranean Sea in northern Algeria. The group, estimated to be anywhere from several hundred to around 1,000 members strong, is now a trans-national terrorist franchise. But in September 2001, it was still a nationalist movement bent on establishing an Islamic state in Algeria. That movement, the Salafist Group for Preaching and Combat, known by its French acronym GSPC, was then focused primarily on fighting Algerian government forces. Even before the group formally became an al-Qaida affiliate, the GSPC had a close working relationship with al-Qaida in Iraq (AQI) leader Abu Musab al-Zarqawi. The Algerian group sent militants to fight against American forces in Iraq. GSPC issued a communiqué on the second anniversary of the September 11 attacks, supporting al-Qaida in its "jihad against the heretic America." In 2006, on the fifth anniversary of 9/11, the GSPC became an official al-Qaida branch. 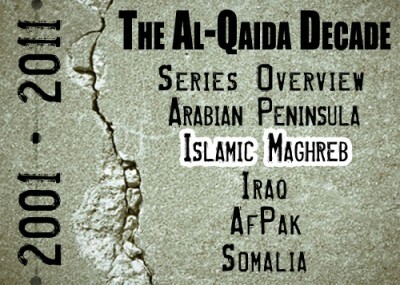 Al-Zawahiri, not bin Laden, organized the al-Qaida merger. "Our brothers will be a thorn in the necks of the American and French crusaders and their allies, and a dagger in the hearts of the French traitors and apostates," said al-Zawahiri. The following year, the GSPC changed its name, and AQIM was born. "Today, you still have a propaganda connection between the groups," said Lebovich, referring to the relationship between AQIM and al-Qaida's core leadership. In August, AQIM released a nearly two-hour propaganda film featuring footage of bin Laden and showcasing its attacks in the Maghreb. In a statement reacting to bin Laden's death, AQIM called the late al-Qaida chief a "valiant Mujahid" and encouraged militants to "rise and oppose the oppressive Western, American, Zionist aggression with all of your capabilities and energy." The statement added, "We are moving steadfastly on [bin Laden's] path..."
AQIM Shura Council member Sheikh Abu 'Ubayda Yousef Al-'Annabi swore allegiance to the new al-Qaida head Ayman al-Zawahiri and said that AQIM is ready to follow his commands. Last September, AQIM chief Abdelmalek Droukdal told France that hostage negotiations for French nationals it had just kidnapped should be conducted through Osama bin Laden himself, and in January 2009, AQIM chief Droukdal called on AQIM to attack Western and Israeli targets the day after Osama bin Laden released an audiotape with a similar message. AQIM chief Droukdal seemed to acknowledge his al-Qaida branch's contribution includes moral support and advice in a 2008 interview with the New York Times. "They supply us and we supply them with any kind of support, loyalty, advice…," he said when asked about the nature of al-Qaida's assistance to AQIM. This picture taken in Mauritania, dated September 25, 2010, was posted online by Al-Andalus, AQIM's media outlet. It reads: "Spoils of the mujahideen in the conflict of Hassi Sidi." But according to Lebovich, that type of propaganda and statements of support might be the extent of the connection between the African al-Qaida branch and its mother organization. "AQIM's command structure has not merged with al-Qaida," he said. The dusty, harsh terrain, he added, prevents easy travel outside of AQIM's bases in Mali and Mauritania. AQIM has failed to launch an attack on European or Western interests outside of Africa. Government officials say that AQIM lacks the ability to launch terrorist attacks outside of its base in northern Algeria and the sub-Saharan Sahel region to Algeria's south. "AQIM is operationally constrained in what kind of role they could take on outside the region," Lebovich said. Though AQIM is not operationally connected to al-Qaida central and has not been able to launch an attack outside its own turf, officials aren't willing to write off the group's international threat. AQIM operatives have planned attacks outside of Africa, but have been arrested before they could carry them out. There have been several arrests of suspected al-Qaida cells in France and Spain. Last month, a Spanish judge accused an al-Qaida militant who swore allegiance to AQIM of plotting to poison Spain's water system in order to avenge bin Laden's death. AQIM, mimicking calls by al-Qaida leadership to back rebels fighting in Arab Spring revolutions against "unjust regimes the West has enforced on our countries," recently called on its members to seize on unrest in nearby countries, like Tunisia and Libya. Reports indicate AQIM militants may have done just that. European Union counter-terrorism coordinator Gilles de Kerchove said earlier this month that AQIM has acquired Libyan weapons that possibly include small arms, machine-guns and surface-to-air missiles. Kerchove added that AQIM "is Africanising and seeking to extend its area of influence." Chad President Déby told the French publication Jeune Afrique in April that al-Qaida militants seized arms, including surface-to-air missiles. An Algerian security official gave Reuters similar information. Anti-tank rocket propelled grenades (RPGs) were delivered via an eight-truck convoy from Libya to northern Mali, a known AQIM stronghold, the official said in April. Lebovich said that even if AQIM has seized those weapons that would be AQIM's "only benefit" from the Libyan unrest. Unlike the Yemeni-based al-Qaida in the Arabian Peninsula (AQAP), which has filled a power void in political unrest that has threatened President Ali Abdullah Saleh's regime, AQIM doesn't have the structures in place to take power. "AQIM is not a political organization," explained Lebovich. So far, Europe and the United States remain unharmed by AQIM's activities. In Africa, however, the group attacks government forces in already unstable political conditions and routinely kidnaps Westerners, once killing an American aid worker. "Al-Qaida in Maghreb is on its way to becoming the best equipped army in the region," Déby said earlier this year. Since early July, AQIM claims it has launched 32 attacks against Algerian security forces. In August, the group claimed responsibility for a suicide bombing on an Algerian police headquarters which injured almost 30 people and for a dual suicide bombing on the Algerian Cherchell Military Academy which killed 18. In July, two Algerian soldiers were killed after an improvised explosive device (IED) hit a convoy. Kidnappings are now AQIM's modus operandi. And while many experts predict the group will remain a local threat, one American official said it could use those acts to become a larger player in the al-Qaida network. In November 2010, U.S. Ambassador-at-Large for the U.S. State Department for Counterterrorism Daniel Benjamin talked about AQIM's fundraising through kidnapping for ransom payments. "[T]here exists the prospect that groups like this will not only become more powerful, more capable…" he said, "but will also be passing funds to other parts of the al-Qaida network." Attacks on Westerners, one French official said, show that AQIM remains focused on the far enemy. "AQIM has become much stronger in Algeria and Mauritania, and the killing of the British hostage and the American is a message they are not only concentrating on Maghreb issues," a senior French counterterrorism official said in July to the New York Times. They are now part of the global jihad."